The introduction was fairly interesting and inspiring in as much as it made me want to get on and read the book. As a thank you for buying the book, I was also given a link to sign up to receive some bonuses. I’ll write about the bonuses in a separate post. However, meanwhile I’ll point out that I didn’t like the sign up process at all. Whilst it’s perfectly normal in this type of offer to ask for your name and email address, this offer also included address and postal code as essential fields. Why do they want to know where I live? I got around that little hassle by inputting the address of a house I know to have been demolished some years ago. True to its author’s convictions, the book itself follows the 80/20 rule, inasmuch as a small percentage of the content provides the most value. Thus each chapter ends with a “Pareto Summary”, which is a bullet point list of the main points he’s made in each chapter. This is a good method of making sure the reader has picked up and understood all the points which have been made. Whilst it would be possible to fly through the book reading only the chapter summaries, it would seem a pity to lose out on reading the further explanations and illustrations. Still, the summaries could be handy for future reference. This explains the Pareto principle, aka the 80/20 rule, and shows how it can be seen in many aspects of life – including business. 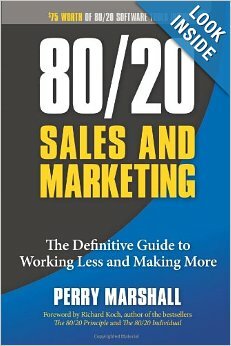 Marshall exhorts the reader to harness the leveraging power of these numbers and put the 80/20 rule to work in their own business. This will result in less work for more profit. He uses a “power curve” graph to demonstrate this principle. The curve is a hyperbola, where the top end heads off towards infinity and the bottom end tapers off towards zero without ever quite reaching it. It’s a useful visual representation of the 80/20 rule. There was nothing new for me here, although I hadn’t tried to visualise the rule before and his graph was helpful in clarifying my thoughts. 80/20 is unconcerned with “average.” Why? Because almost nobody is average, and the ones who are don’t matter much anyway. Instead of emphasizing mediocrity, the Power Curve focuses on ability. It zeroes in on the best, the cream of the crop. This chapter would be a useful introduction to someone who is new to the Pareto principle or would like a better understanding of it. However, Marshall does tend to overstate the case in my opinion, with unbacked assertions (as well as some flawed arithmetic). For instance, he talks about the productivity of the world’s countries as if all of them were equal sizes (“63 percent of ALL wealth is generated by 5 percent of the countries”), which of course robs his illustration of most of its meaning. This chapter describes how to target the right people. We see this happening all the time in various circumstances both online and offline. It’s not just a case of qualifying the right leads but also disqualifying those who aren’t likely to help you achieve their goals. (We’ve discussed this elsewhere in terms of Nigerian scammers. They’ll quite happily tell you they’re from Nigeria because it puts off all of the sceptics who’ve heard of the Nigerian 419 scam and leaves only the gullible “marks”.) Marshall describes how you too can disqualify the “marks” who aren’t going to be profitable for you. The point is that regardless of what sales techniques you use, you must sell to the right people. This chapter gives you a heads-up on targeting the right audience. Here we get a lengthy anecdote reiterating the points made in Chapter 2 and spelling out again the points he’d made in Chapter 1. You can skip this chapter if you’re short of time. This chapter is about where to find the right customers. It starts with another lengthy anecdote of Marshall’s early career before he found success. Then he goes on to recommend his own book, which you can use to decide whether Facebook is the right place for you to look for those customers. This is followed by some “cardinal rules” of a successful 80/20 sales person, which were pretty useful (assuming you don’t have sales in your skill set). Next he talks about ways to build traffic, but there’s nothing new here. This is where the book appears to change gear away from discussing the 80/20 rule, what it is, and how and why you should use it. The reader is given a link to a tool by Perry Marshall which helps to quantify where the target audience lies. The chapter very much consists of using his Power Curve concept to succeed in business. How far it’s actually useful depends on what you’re using it for – after all, some businesses make millions from the mass market. As Marshall says himself, 80/20 isn’t universally applicable, and the most useful ratio to study in a given situation may be 60/40, 70/30 or even 99/1. The problem is: how do you decide which is the most useful? Marshall doesn’t say. This chapter introduces the Power Triangle. There are three aspects to making money: traffic, conversions, economics. These three combined form the basis of all sales and marketing. Then follows a lot of explanation about how this works and how using the Power Triangle can help you. The 80/20 rule is a core concept of the triangle. Hmm, I didn’t learn anything new, it was more a case of having existing concepts explained in a different way. Much of it was reiterating the concepts introduced in Chapter 2 yet again. After another lengthy anecdote about his friend, Marshall picks up again on the idea in Chapter 2 of disqualifying the least useful leads, outlines the “5 Power Disqualifiers”, and gives some sales tips. It’s quite useful, but much of it is probably obvious to many people. This chapter is about getting your USP (unique selling proposition) right, along with examples of USPs which are “good” and “bad”. It’s like being in a Marketing 101 class. Most business people would know these things already. This chapter proceeds with the advice that you must test what’s working for your business. Marshall then advises using AdWords to get more traffic and gives some very basic advice about how to use it. He takes the opportunity to suggest you buy his book about AdWords and sign up for a free online course which he offers. Then he gives a lengthy explanation about what split testing is so you can get the maximum benefit from doing it. Now the reader is advised to scale up. Dominating the market in your niche is all about split testing (Chapter 9) and remembering that, as with most things, winner takes all – or at least a disproportionate share. This chapter advises that you must expand and diversify to succeed. First of all, Marshall says that search engine traffic is likely to represent a very small percentage of your potential customers. This seems like good advice to me! He also says not to rely too much on any single source – again good advice. The chapter continues with advice about how to use the Power Curve to move in the right direction and achieve much better results. It’s all pretty good advice and something worth referring back to when you’re making business strategy decisions. This chapter discusses pricing strategy and how to make the most of each customer. Again, the Power Curve is used to illustrate the points which Marshall is making. Using Starbucks as an example, he gives the reader a heads-up of a good business strategy. I like it! Expand, diversify, add extra value. Don’t leave money on the table. After more personal anecdotes, Marshall moves on to discuss Power Guarantees. This is about limiting any potential risk for the customer. Again we’re into the realm of buyer psychology. It’s also about who takes the risk. If you don’t have faith in whatever it is you’re selling, then how can you expect your customer to take that risk? Some of this refers back to what we learned about Power Disqualifiers in Chapter 2. This chapter is about harnessing natural forces and how a small action can create a massive result. That’s the power of the 80/20 rule. Marshall tells us about about rivers, canyons, sand dunes and weather and says we can learn from this and apply the same concept to our businesses. I didn’t find it particularly useful. This chapter tells us how to boost our earnings by using the Power Curve to figure out how we should be spending our time. You can increase your income by concentrating on the more profitable activities and outsourcing the others to a lower paid worker. This is often true, but it’s not exactly rocket science. You can take his Marketing DNA test, which is included free along with the other supplemental information, to find out where your natural communication abilities lie. Is this really necessary? Wouldn’t most people already know where they’re more comfortable, eg writing rather than speaking? Next apply the 80/20 rule. You should concentrate on what you do best by building on your strongest skills, and get others to do the stuff you’re not so good at. You can also develop a “love list” and a “hate list” to guide you in selecting the tasks you should be outsourcing. This is about hiring and outsourcing. Use “auditions”, not interviews. In other words, try people out in the job before you make the commitment of hiring them. You can save time by using disqualifiers so you don’t have to waste time dealing with applicants who don’t fit the bill. The 80/20 rule applies to hiring people too – concentrate on getting the best and most profitable ones. Next there’s more about outsourcing. This time it’s about hiring a PA (personal assistant). It reiterates what he’s already told us about outsourcing and auditioning and how the 80/20 rule applies. He concludes the chapter by telling us that anyone on over $30 per hour will come out ahead if they hire a good PA.
Fire the bottom 10%! This applies to customers as well as employees because the worst of them are not worth keeping. Polarise your market by dividing prospects into segments, eg from “not interested” to “addicted”. He explains the saddle-curve phenomenon which can sometimes be observed with the 80/20 rule. This is where people either love you or hate you (or your product). Thus you have two 20%s: the love and the hate side of the curve. You can clearly see this in politics and in markets where there is controversy around the seller or the product. Take a side and be quotable. You might even become a mini-celebrity. There some interesting ideas in here, a few of which I hadn’t even thought about before. This chapter outlines a method of researching what the prospects in your market are really looking for. As usual, the goal is to concentrate your efforts on the best prospects. Next up is more encouragement to test so we know which of our efforts are working and which aren’t. Marshall gives us a shortlist of things to test and warns the reader not to get so bogged down in analysing figures that they never get anything else done. He suggests what to measure and track and what to ignore. RFM – recency, frequency, money. If you can discover which of your customers bought more recently, how frequently they buy, and how much they’ve spent with you, this puts you in a better position to know where to focus your attention. All of the RFM factors obey the 80/20 rule and you can create a matrix to identify where the biggest profits are likely to be made. Data mining can be used to find out where your hidden 80/20s are. This is very interesting. And there’s more. Marshall then goes on to talk about how to segment your email lists to sell more. This is a motivational talk, encompassing religion and charity, about not taking the 80/20 too far in your life. The final chapter in the book mainly consists of life stories and anecdotes. I think it’s intended to inspire the reader by illustrating the point “Don’t sell harder. Market smarter”, and also to emphasise the moral responsibility not to take the 80/20 rule to mercenary extremes. This is about an experience of religious revelation and a bit of preaching to trust in God. Then there’s an appendix with Power Curve case studies for maths geeks, which is quite interesting if you’re into that type of thing. Although I wasn’t convinced by all of Marshall’s attempts to persuade me of the power of Pareto, there was enough good stuff in the book for me not to request a refund. It helped me to clarify and focus my thinking. Sure, I already knew what the Pareto principle was and had a vague understanding of it before, but there were some good ideas in it and the business focus on the principle helped too. Some chapters were excellent, but equally there were some I didn’t appreciate. That said, it was probably written for an American audience and they’re more likely to be church-goers than their heathen British cousins. I didn’t like the religious sermons at all. All in all, I would recommend this book because most people can probably learn at least something from it. There may be chapters which you want to skip over. I enjoyed the book, but it seemed to have a TON of fluff, and then as you said, summaries at the end of each chapter. I hate how authors never write short books, thinking nobody will buy them, because this one could have been a lot more valuable had it been written in a more “to-the-point” way. Thanks for your comment. It sounds as though your opinion was pretty much the same as mine on this book. I’ve been dabbling in Kindle publishing and have seen many competitors churn out books, even a book a week. I’ve been highly critical of them. Many of them have simply not met my expected quality standard with their emphasis on creating a series of books. (Writing a series is considered by many to be essential if you want to make money on Kindle.) This is a big part of why I would hesitate to publish a very short book. Perhaps I’ll think again and attempt to write a short book with plenty of good info and no fluff. Thanks for the idea.